Where is Matthew Smith? Eh?? Please note that this website is perilously out of date, and requires a lot of updating, mainly because Matthew Smith is no longer missing. It was one of the main aims in life of many of the posters to comp.sys.sinclair to locate the whereabouts of Matthew Smith (if only to obtain a copy of AOTMZFECFM or WMTT) until we found him. The person claiming to be him (apologies to Matthew for the impolite tone, but fraudsters are rife) seems genuine, so until proven otherwise, I'm prepared to stick my neck out and and say Yes! It is him!! Hurrah!!! The aim of this page is to log, all in one place, any and all information about him. As to the genuine-ness of any of these postings, I don't know. I have just been reading your Mathew Smith page. 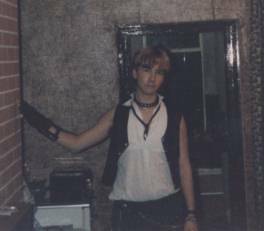 I knew him back in the early '80s via his sister (Michelle) , who I can probably still contact if neccessary next time I am in Wallasey. I was there when he was designing Willy and helped out with some ideas for the levels , the Sky Lab Landing bay was mine , the toilet monsters where his little brothers who we used to wind up a lot. 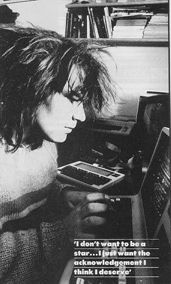 I was impressed the way he wrote on a Tandy and then downloaded to the speccy as if it was a printer. Yes I am afraid he was into drugs , cannabis featured heavily in our lives back then (he used to make brilliant hash cookies), but he always had good deeds in him ( remember camping in Anglesy when he annouuced he had bought us all tickets to Roger Waters for that night at the NEC, 15 of us, and would take no money). He experimented with drugs like the rest of us, dope , speed and acid. It was when he started to use cocaine and talk of heroin that I drifted away from the group we hung out with. It was obvious then taht he was going off the rails and faimilly and friends were unable to to stop him. I remember he built a chop once and roe it to the kent custom show, no MOT, tax, insurance, license. He was stopped after about 50 miles. Last time I saw Michelle she told me about the institute and that he had left (got away?) and was indeed in Amsterdam. So the sightings of him there sound about right. This is what a guy told me... I hope this helps... "I last saw Mathew Smith at a Harrogate Acorn user show about 2 years ago. He was at the time working on the RISC user stand and commented on how good one of my programmes was (His mag had just reviewed it (Although it was only an educational music game)). He look as if he had been enjoying his food a bit lately but otherwise seemed quite sane. I noticed his name bage and thought "No it can't.." but I asked about with several other Acorn developers and they confermed that it was indead THE Mathew Smith!" Mathew smith has semi scouse accent. The area he comes from is Wallasey in the Wirral, between liverpool and wales. he did lose the plot a bit thanks to class a's but when i saw him (couple of years ago)seemed sorted out'ish. sat down with him he explained he's been working on a soccer game for ages. I could not even believe i was in his lounge. he was renting a house with a teacher. last thing i remember him telling me was that he was going to move to amsterdam (good move) and possibly had a job lined up in a fish factory. all i can say is that that upset me a bit and is a waste. Its not that I know him well, just that a friend took me round to his house because he knew him. My friend knew that mat had written computer games, but had no idea about computers and thus didnot know of mats geneus. I am not making this up because basically i have better things to do and the most i know is that when i saw him, about 2-3 years ago he was living in a shared house in wallasey village with a teacher. The air was smokey and mat and i were talking about circuits. It was at this time i had a free radio station in Merseyside and he was telling me about some book he had with radio transmitter circuits in. When i brought up willy/miner he went a bit quiet. I asked what he was doing these days and he said he had been working on a real rules soccer game for a few years. Stuart James Fotheringham sends in.. 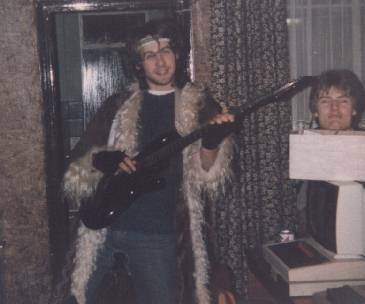 I worked, and partied, with Matthew a lot in 1984 during my time at Software Projects Ltd, Liverpool. Matthew, Marc Dawson [now of Software Creations] and myself were developing "Willy Meets The Taxman". Matthew had 'worked' on WMTT for months, but had really done nothing (his recreational activities prevented him from concentrating for periods longer than a few seconds). Alan Maton was the producer, Matthew was the designer/director, Marc was the programmer and I was the graphics artist -- you may be shocked to know that we were developing for the Commodore 64, with a Spectrum third-party conversion to follow. 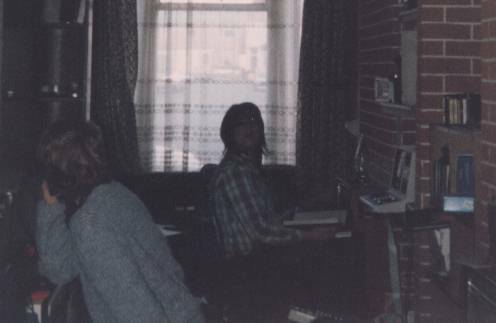 We were based at my house in Holt Road in Birkenhead, provided rent-free by Software Projects, that I shared with Steve Wetherill [developer of JSW2, and now of Westwood Studios]. 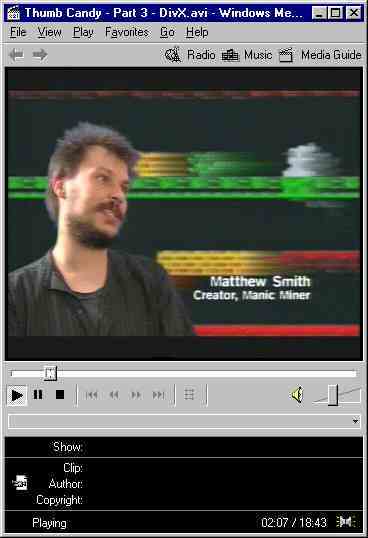 Marc and I were brought in to help Matthew deliver something, anything, to meet the demand for a third Miner Willy game. Our project was cancelled after three months -- all we had delivered was a single screen. WMTT was a raised view, rather than a sideways view game, with scrolling as well as fixed screen levels. Willy started at the bottom of the main access screen, he had been redesigned to look like more like Mario (we all loved Donkey Kong), and ran to the top of the screen where there was excessive foliage and trees (inspired by Sabre Wulf). On his way up the screen Willy had to avoid 'running and Cossack dancing' oak trees -- they were great. In the centre of the foliage was the BanYan tree extending off the top of the screen, and either side were three paths into the forest. The idea was that Willy had to complete the six areas (in any order) by going down these paths, via this screen, collect enough flashing pound notes and then climb the BanYan tree -- where the next access screen, with another set of paths off, would be. Thinking back, WMTT was quite a similar concept to the later Super Mario Bros games on the NES, although you could also run 'in to' (up) and 'out of' (down) the screen. Marc and I left to help form Odin Computer Graphics, where we were later joined by Steve Wetherill -- Nodes Of Yesod was our first published title. We still used to go clubbing and hang out with Matthew, although nothing lived up to the toga incident, but thing went rapidly downhill for him from there -- especially when Matthew Met The Taxman. Chris Cannon kept in touch with Matthew for years; but doesn't know where he is now. Conor McCarthy's sighting sounds very much like Matthew, especially the motor bike stuff. He really got into bikes after JSW -- I crashed his shiny, new, first motorbike the day he bought it, oops! It's true that I kept in touch with Matthew for ages, but then he just seemed to disappear off the planet about seven or eight years ago. I did hear a rumour that he'd changed his name by deed poll to Matthew From-Earth. Sound's a bit strange,huh? Well, it sounds like the sort of thing he'd do. The last time I saw him, he'd just been done by the police for driving an unlicenced motor vehicle whilst under the influence of alchohol. I saw the offending vehicle - it was an old bicycle with a vacuum cleaner motor and car battery fixed onto it. He was always doing crazy things like that. You got used to it after a while! Well, that was about seven or eight years ago as I said. I've only heard bits and pieces about him from mutual friends since. The drugs story would seem to be a likely one, although I can't actually see him using class 'A's at all. He was a pot-head, make no mistake, but I don't ever remember him taking anything else - except for copious amounts of beer. If he ever does decide to get back in touch (Matt, if you're out there, my parent's phone number is still the same!!) I'll let the world know he's still alive via yourself. If he wants me to, of course. Many regards, Chris Cannon PS. I now work in the same department in Royal and SunAlliance as Tony Milner (one of the founders of Bug-Byte) who gave Matthew and myself our first jobs! Small world, eh? I recently heard of a Matthew Smith sighting, a friend of a friend met a guy called Mat Smith in a commune in the Netherlands (?). Seems he's now a motor bike mechanic. 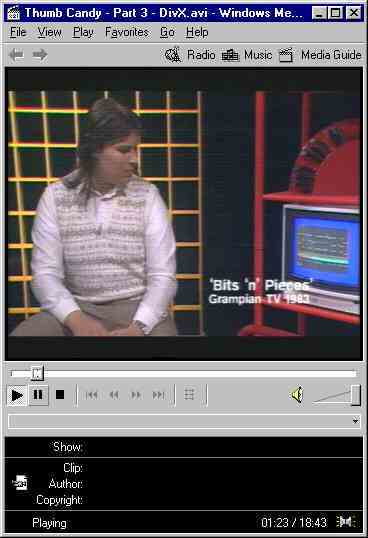 The person who met him wasn't a spectrum fan, never having owned one, but Mat told him about how he "wrote some video games in the 80's, got burnt out, ended up in a mental institution". The date was the end of Summer 1995, and the place was in a commune type (possibly hostel style) accomodation in Amsterdam in the Netherlands. FOAF (since I can't remember his real name) met a bike mechanic called 'Mat Smith', in his late 20s. 'Mat' told him about how he recently recovered from drug problems, and was putting his life back together after spending some time being treated for 'psychological problems'. 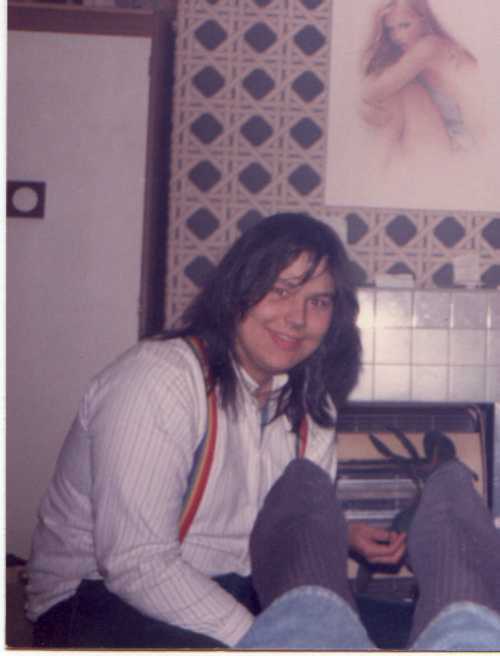 He had written some video games for the ZX Spectrum in the '80s, and made a lot of money, got into drugs and .... hence the gap of several years. Foaf was telling a friend of his about this, and having described 'Mat' as being quite large, and dark hair/complexion, concluded that it was in fact the Matthew Smith Of Miner Willy Fame. Thanks to Conor McCarthy for continuing our quest to find The Man. Following this, Ken Keenan (kenk@corel.ie) wrote in with..
Chinese whispers, eh? Even in these days of wire and fibre, you just can't win. I was just looking at your `Where is Matthew Smith?' page. You see, I am one of the F's in Conor McCarthy's mail about the FOAF who discovered Matthew's presence in the Netherlands. Not the one who actually met the man, I'm afraid-- he doesn't have an Internet account, although he finds it quite amusing that he managed to cause a stir on the Net anyway without having one. My mate didn't meet Matthew Smith in Amsterdam-- it was in Leiden (or is it Leyden? One's in Germany and one's in the Netherlands and I always get confused. The one in the Netherlands, anyway) This commune was fairly serious in that if you wanted to stay there for any length of time, you had to provide your own living space. So the annexe of the house in which Matthew Smith lived was actually built by himself (don't think it had ropes swinging from the ceiling or spikes on the floor, tho'). This seems to fit well with sentiments expressed by Matthew Smith in the SU interview (which I'd read when it was first published and all but forgotten). I could probably pump my mate for the exact address, but even assuming that Matthews's still there, I'd feel it would be something of an invasion of privacy. I got the impression from my mate's stories that Matthew had a fairly harrowing time of it and wants to forget about that part of his life. Matthew Smith stayed in Anna's Leiden (commune) for quite some time. I don't know the true story why he left, but he then lived for half a year in my friend's house in Voorschoten (near Leiden, Holland) He had a laptop and did some programming.In january he had to leave the Netherlands because his stay was illegal. He returned to England. He also had an internet account at XS4ALL.NL. His E-mail adress was earthman@xs4all.nl. In january there was a big fire at Anna Leiden. Anna Leiden is now completed destroyed. The area is cleaned up and surrounded with fences. Andy Noble has sent me this dubious (by his own admission) letter that he received. However, we now know that this is genuine. Ran across your page after the Electronic Telegraph article. You may have seen/played the version of Manic Miner for the PC I did. Yes? No? Anyway after several months of its distribution on the Internet the inevitable happened. I don't believe it is real but you never know. A part of you screams out that it is total fabrication but just a small part, a very small part keeps poking you in the ribs saying "I could be you know!". I doubt it but what the hell, I though you should at least see it. I showed it to Andy Davis of Alchemist Research who thinks the same as I do. I am just back on the Net after a long absence. I searched for mention of myself and my early work. I was directed to your page. I downloaded MANICU10.EXE and played the first few levels. I plays just like the original and was a fine conversion. I started it first under Win3.1 and it IDed my SB 16 stereo then crashed to EMM protection. Now I start from DOS the sound is gone. There is no scrolling message, no dancing willy. My SB is at A240 I5 D1 H5. 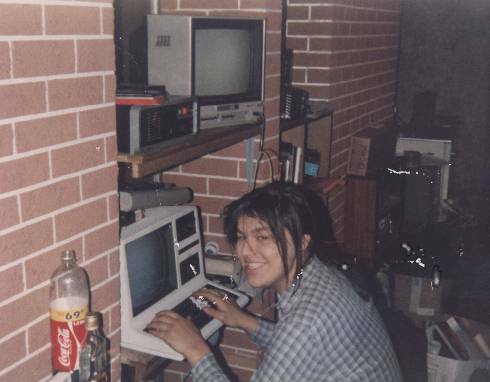 I have a 486SX with 8Mb and dodgy DMA. I shall let you know if reinstalling helps. I was a trifle alarmed to see copyright notices on my work but I don't think it is worth my while sueing anyone at this stage. If the game has genuinely passed into the public domain then I am OK with this. Whoever granted rights to Alchemist Research were misrepresenting themselves and I hope no money changed hands. Bug Byte and Software Projects only manufactured under license and have both ceased trading. I was a director at Software Projects when the company was wound up. I am still owed muchos denarios so let me know if Sega or Nintendo get in touch. I have been programming off and on since then but I haven't reached version 1.0 on anything. I was told we had secured the Warner cartoons so I started a Roadrunner and Wile E Coyote game. In a few weeks I had the finest multi-level sideways scrolling road program possible on the Speccy. I also learned that the Warner license was vapour. I tried to finish the game as Attack of the Mutant Zombie Flesh-Eating Chickens from Mars but the Speccy market was waning. I accepted my partners arguments that they had the Amigas because they needed to play while I needed to concentrate. When they wouldn't let me have an ST as good as theirs we parted company. I did Manic Miner in a Gem Window in GST C. The game was finished and working but GEM was too horrible to work at the same time. I did learn how to program dodgy GUI event-driven catastrophes though so Windows is a doddle now. My Win ref book is in Dutch but it makes sense to me. I had v0.8 on a Footy game on the ST (asm (GENST2)), v0.3 on a Road-Rash/Doom/Frontier combo on the PC (TCv2.0(nice but no EMS or XMS)). The disks from all these have passed away. I had started to write a programming tool that was ahead of its time in 1986 and I have since seen Windows evolve into the user interface that my program had. I have stopped tearing my hair out though as Win lacks the guts of my basic idea. I am doing it as a Win App instead. I have Qbasic, VB4 and various shareware ASM's and C's. I left my TC2 in Nederland so I have no reliable C++ compiler. Basic is fine for the prototype but a trifle slow and Qbasic is full of bugs and omissions and VB won't do ASM routines. As more parts of my system work though it will all come together. My tool is powerful. My tool is Bad. My tool is enough to make governments mad. If we can come to a non- disclosure agreement then I could let you Beta as soon as it appears to do something useful. If anybody else has any more information, or indeed any pictures then please do not hesitate to send them to me. "There is not enough land. True communists are people who live in communes, villages, tribes. I'd like to live like that, but always with the communications we've got. There should be an end to cities. Cities should have walls around them to keep the city in." -- Matthew Smith, Sinclair User, December 1984.